Wacaco makes products that let you enjoy espresso on the go. For better or worse, Keurig revolutionized the way coffee is consumed. It’s now possible to have higher quality coffee in almost an instant, without having to run to the nearest Starbucks or local coffee shop. Wacaco, like Keurig, may have revolutionized the coffee game once again. The company makes portable espresso machines, allowing you to make fresh espresso shots without having to use a fancy, expensive machine. Wacaco’s products are about the size of a water bottle, and they start at the relatively affordable cost of $50. 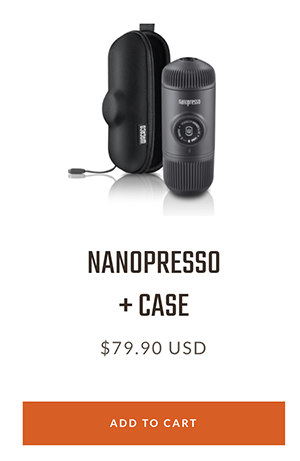 For an extra $30, you can buy a case so that it’s easier to carry your Wacaco Minipresso on the go. Wacaco’s Minipresso products also come in several colors, from the default black to the bright and vibrant yellow, orange, and red models. In terms of functionality, there are two options. The Minipresso NS uses NS capsules (much in the vein of Keurig pouches) to brew the coffee. The Minipresso GR lets you use your own ground coffee, so you can test out different measurements and roasts. 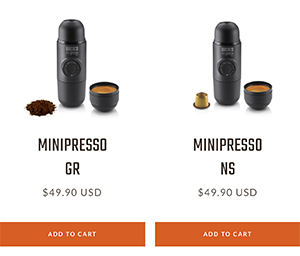 Both are the exact same cost, and which one you pick depends on your coffee preferences. Although the company is based in Hong Kong, they’re currently shipping worldwide. If you’ve ever craved espresso on the go, or been in a situation where you were desperate for coffee but unable to find it anywhere, consider Wacaco.